A restore point is a representation of the Smoothwall's system files at a point in time. System Restore allows your Smoothwall to be rolled back to a restore point in case of problems. User restore points are those that are manually created. Only one user restore point exists. Every time a new user restore point is created, the previous one is overwritten. These are restore points automatically created by the Smoothwall before an update to the software is made — see Updating the Smoothwall. Should a problem arise with the update you are trying to install, you can roll back to the previous software installation. Like the user restore point, only one system restore point exists. An entry is made to the System log (see Viewing System Logs) when the system restore point is created. What is Included in a Restore Point? • Note that MAC addresses are also included in the restore point. Care should be taken when rolling back to a restore point where the hardware has changed. • If you make use of a Google directory service, ensure you create your restore point after the Smoothwall has completed its synchronization with Google, as the usernames, user groups, and organizational units are held locally. For more information about using Google as a directory service, see Configuring Google as a Directory Service. So what happens to my logs and reporting data files if I roll back to a restore point? Logs and reporting data are not removed from the system or restarted into new files. They continue "as if nothing happened". For example, let's say you create a restore point on January 1st. For the next three months, the Smoothwall continues with operations — building log and reporting files. On March 20th, a situation occurs where you need to rollback to the last known "good" point— January 1st. All installed software and modules, and resulting configuration, are restored to how they were on January 1st. However, the log files still contain all data from between January 1st and March 20th. Any report run after March 20th will still contain data from the same time period (if requested). Note: At the time of writing, only one restore point can be manually created from the administration user interface. Each new, manually created restore point overwrites the previously created one, if it exists. 1. Go to System > Maintenance > System restore. 2. From the User restore point heading, click New restore point. 3. Configure a meaningful Name for this restore point. Tip: Each restore point is date stamped, and displayed with such on the System Restore page. The installed product release is also displayed. You do not need to include this information in the restore point name. Every time you manually create a restore point, it overwrites the existing User restore point, if one exists. When creating new restore points, you must confirm whether to proceed first. Why Can't I Create a Restore Point? Typically, the only reason a restore point cannot be created is because there is insufficient free space on the hard drive. System Restore error messages are written to the System log — see Viewing System Logs. Note: The following procedure is suitable for restoring both User restore points and System restore points. 2. Locate the relevant restore point. 4. Rolling back to a restore point does not roll back log and reporting data files. Confirm your understanding in the dialog. To complete the roll back, the Smoothwall reboots itself. 6. Once the restoration and reboot are completed, you are returned to the login screen. Note: The restore point you rolled back to remains available in either the User restore point or System restore point sections. There is no limit to the number of times you can roll back to the same restore point. Tip: It is recommended you test that all services are available. Note: You can only rename manually created restore points. 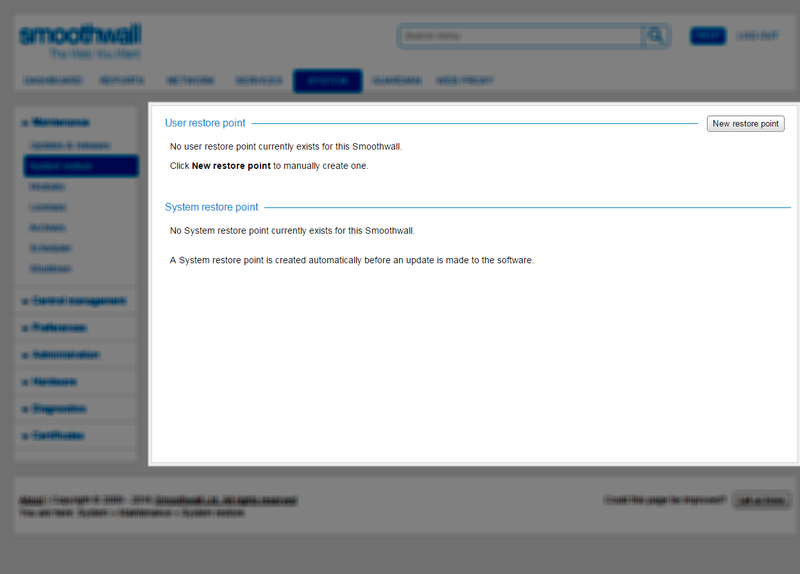 Those created by the Smoothwall, that is, those under System restore point, cannot be renamed. 2. Locate the relevant restore point from the User restore point section. 4. Configure a new meaningful Name. Note: You can only delete manually created restore points. Those created by the Smoothwall, that is, those under System restore point, cannot be deleted.